2014-15 Florida basketball primer: Can the Gators keep it going with a rebuilt starting five? Despite losing four senior starters to graduation, Florida Gators basketball will enter the 2014-15 season as the consensus No. 7 team in the nation, coming off its return to the Final Four for the first time since 2006-07. Florida finished the 2013-14 campaign with a program-best 36-3 record, winning a program-record 30-straight games at one point and dropping its three contests to a pair of opponents including twice to eventual national champion UConn. UF beat Kentucky thrice (including in the finals of the 2014 SEC Tournament), became the first SEC team to finish 18-0 in league play (21-0 including the SEC Tournament), and went undefeated (17-0) in the friendly confines of the Stephen C. O’Connell Center. The Gators also captured their second-straight SEC regular-season crown and swept both SEC championship titles for just the second time in program history (2007). Though none of Florida’s four seniors were selected in the 2014 NBA Draft, three were given tryouts with NBA teams and center Patric Young caught on with the New Orleans Pelicans as an undrafted free agent. 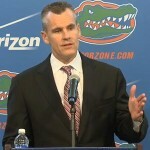 Head coach Billy Donovan, entering his 19th year with the program coming off his third SEC Coach of the Year award in four seasons, will look to lead UF to at least the Elite Eight round of the NCAA Tournament for the fifth-straight season. He brings two new transfers and one of the nation’s best recruiting classes into the fold, though not all of the players will be available this season. Here’s what Donovan (451-169, 195-100 SEC) has to work with as the Gators prepare for their exhibition game on Thursday evening in Gainesville, Florida. >> Jump to exhibition game information. Point guard Scottie Wilbekin: When not suspended from the team for multiple violations of team rules, Wilbekin ran Florida’s offense after taking over for Erving Walker and was the team’s best on-ball defender for nearly three fully seasons. He truly broke out during his senior campaign, earning SEC Player of the Year honors, and plenty of accolades for turning his life around. Center Patric Young: Donovan demanded much from Young throughout his career with the Gators. Though his offensive game never expanded as much as some may have liked, Young was arguably the best pick-and-roll defender in school history, earned SEC Defensive Player of the Year honors as a senior, and will be remembered for his effort, intensity, integrity and intelligence both on and off the court. Forwards Casey Prather and Will Yeguete: Though each had different specializations – Prather using his athleticism to score by attacking the basket, Yeguete using his brains to give great effort by rebounding and defending – the two complimented each other quite well and were key cogs that led Florida to numerous program records. Junior guard Michael Fraizer II: The lone starter returning from last season, Frazier scored 12.4 points per game (third most on the team) and made 44.7 percent of his three-point shots while setting a new program record for most triples in a single season (118). He was also the team’s second-best free throw shooter (.725), a skill he may be able to utilize more during his third campaign as Donovan is expecting him to attack the basket and play inside the arc when playing either the two or three. Where Frazier needs to make his biggest gain is as a rebounder; he averaged just 3.5 boards per contest last season but will likely need to rebound at a rate similar to Bradley Beal in 2011-12 (6.7) or Chandler Parsons in 2010-11 (7.8). Sophomore point guard Kasey Hill: Gaining some much-needed experience as a floor general last season when he was a spot-starter for Wilbekin while the senior was suspended and injured, Hill dealt with multiple ailments himself and definitely hit the rookie wall in the middle of the 2013-14 campaign. Now Hill has the Gators’ offense all to himself. Ball movement is a non-issue for Hill, who prefers to set up his teammates and averaged 3.1 dimes per game (0.5 fewer than Wilbekin) despite playing 12 fewer minutes than the senior. A lane-driver who thrives on drawing contact, Hill must take better advantage of scoring opportunities when he gets to the line (.663) and figure out a way to be significantly more efficient from beyond the arc (.143). Redshirt junior forward Dorian Finney-Smith: No longer a reserve, Finney-Smith will not have an opportunity to win back-to-back SEC Sixth Man of the Year honors, but he will get every opportunity to be a big-time contributor as a starter for Florida in 2014-15. Though he averaged 8.7 points and 6.7 rebounds a year ago, Finney-Smith scored 14 points or more 10 times during the campaign and achieved nine boards or more or 11 occasions. At 6-foot-8, his length is a huge asset for Florida, and his versatility allows him to play and defend four positions. Consistency is the key for Finney-Smith, who also needs to ensure he is more careful when possessing the ball this season. Freshman forward Devin Robinson: A five-star prospect ranked as the No. 20 overall prospect by Rivals, Robinson has been as good as advertised during practices and scrimmages…at least on the offensive end. At 6-foot-8 and 178 pounds, Robinson still needs to gain some mass, but his length and natural scoring ability should get him major minutes right out of the gate for the Gators. Robinson may start slow as he gets adjusted to the collegiate game, but he could certainly blossom as the season goes on. Freshman point guard Chris Chiozza: Florida’s only true back-up floor general, Chiozza is a four-star prospect (ranked No. 42 nationally) who like Hill prefers to set up his teammates as opposed to being a high-volume scorer from the position. Chiozza admitted that picking up Donovan’s defensive rotations has been an issue during his early portion of his career, but he was confident that it would all come together sooner than later. His importance cannot be overstated, especially considering Hill’s injury history during his freshman campaign. Redshirt senior center Jon Horford: A veteran who has played in 98 college games over three non-redshirt seasons, Horford was immediately eligible to play for the Gators this season as a graduate transfer from Michigan. He is the biggest player on the active roster at 6-foot-10 and 245 pounds, and Horford is able to fill an immediate need in the frontcourt following the departures of Young and Yeguete. Though Horford spent most of his time with the Wolverines playing in the paint, he is also a capable three-point shooter and will likely have the opportunity to take some jump shots when open. How will forwards sophomore Chris Walker and redshirt junior Alex Murphy help the program once they are cleared to play? Suspended for the first three two regular-season games due to a violation of team rules, Walker will once again be watching from the sideline as his teammates begin a season without him in the fold. However, when he does get on the court, the beefed-up Walker (6-foot-10, 220 pounds) will look to make an impact for Florida by banging in the low post, swatting shots and using his overall athleticism to contribute on both ends of the court. Joining the program late last season, Walker was mentally swimming when he saw action in the spring; now he has the opportunity to show what he can do when fully prepared to play. Considering Walker has already decided that he will enter the 2015 NBA Draft following the season, it is time for him to live up to his five-star hype. A mid-season transfer last year, Murphy will not be eligible until the conclusion of the fall semester. He has hardly seen the college basketball court, playing a deep reserve role for Duke in a total of 36 games over the last two seasons. Donovan is high on Murphy’s ability to contribute once he’s eligible, though he will have to find a way to fit into what could be a well-oiled rotation by the time he steps on the court. What will the Gators’ walking wounded from last season – guards redshirt junior Eli Carter and redshirt sophomore Dillon Graham – be able to contribute and how will the loss of junior guard/forward DeVon Walker affect the team? Florida has not seen much from Carter or Graham, though the former had already made a name for himself at Rutgers before transferring to UF. Carter averaged 14.3 points per game for the Scarlet Knights before fracturing the fibula in his right leg, a tough injury that ended his sophomore season and forced him to sit out the entire 2013-14 campaign despite the fact that he was cleared to play immediately by the NCAA as a transfer. He dealt with a sore ankle this offseason but has been a full participant in practice, according to Donovan, and could be an important piece of the Gators’ backcourt, especially as another ball-handler and rim-attacker. Graham, on the other hand, is a total question mark and did not prove to be a reliable shooter as a true freshman in 2012-13. Coming off of surgery for bone chips in both hits, he likely has a ways to go in order to see a legitimate amount of playing time. The loss of DeVon Walker to a torn ACL in the offseason was a tough blow for Florida, which had seen a player who once considered transferring out of UF finally begin to blossom. He started the first six games of his sophomore season and played in 60 contests over two years. Donovan believed DeVon Walker was ready to breakout and see a significant number of minutes for the Gators but that will now have to wait until next season. 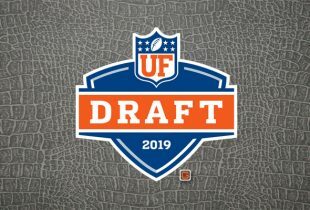 Though he will take a medical redshirt, he is expected to be cleared to return to practice in the spring, which will help UF gear up for the postseason. Can Donovan actually coach this team back to the a fifth-straight Elite Eight, second-straight Final Four or – better yet – the national title game for the first time since 2007? Simply put, it’s a lot to ask. Though there is some veteran leadership on the team, Florida will be relatively young and inexperienced with a ton of new faces feeling their way around until they establish roles. The good news? That’s what was said about UF following the departures of David Lee, Matt Walsh and Anthony Roberson in 2005-06. Also, college basketball has a long season, spanning five months with nearly 40 games to be played if the Gators are lucky. As Donovan has stated ad nauseum to this point, Florida will be able to make its greatest gains by improving defensively and becoming a more cohesive unit. When or how quickly that will happen remains to be seen, but if SEC fans learned anything from watching Kentucky last season, there is no such thing as too late for things to fall into place. » Florida enters its Thursday contest against Barry with wins in 23-straight exhibition games. The Gators are 37-2-1 under Donovan in exhibition affairs and have scored 100+ points in three-straight such contests. » UF and BU last went head-to-head on Nov. 5, 2006, with the Orange and Blue pulling out a 83-47 exhibition victory. » Thursday’s game will utilize a 30-second shot clock as an experiment. » Chris Walker (suspension) and Murphy (transfer eligibility) will not compete in the exhibition game. Walker will return to the court on Nov. 21 against Louisiana-Monroe. » Barry outrebounded Louisville 53-41 in an exhibition loss to the Cardinals on Nov. 1. » Florida replaced two staff members this offseason with Billy Schmidt joining the program as the new assistant to the head coach, and Peter Gash as video coordinator. 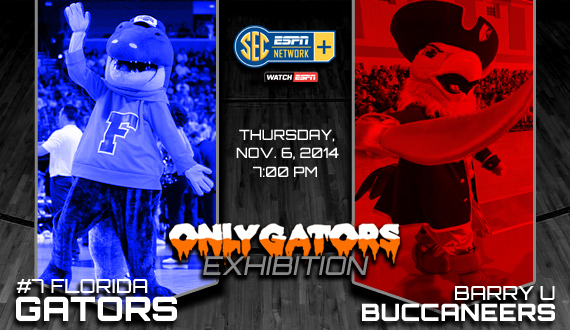 » The Gators’ exhibition game will only be available on SEC Network + via WatchESPN.com. Click here to watch the game live at 7 p.m.
Go Gators! Should be a fun season, regardless of how far we get in the tourney. Looks like we have a nice mix of youth and (some) experience as well as size. Last year we were insane on D. Don’t expect a repeat of that, but if we can come close, this team has the pieces to go far. Is there any broadcast information on the game? Hail to SEC network/SEC network +! So, will this count as one of Walker’s 2 games? Thankfully we get him back for a quick primer against La-Monroe before the Bahamas tournament. Thank you! Did I just completely miss “regular season” or did you just add that? No worries. I’m fired up for Billy ball!!! Go Gators!! !